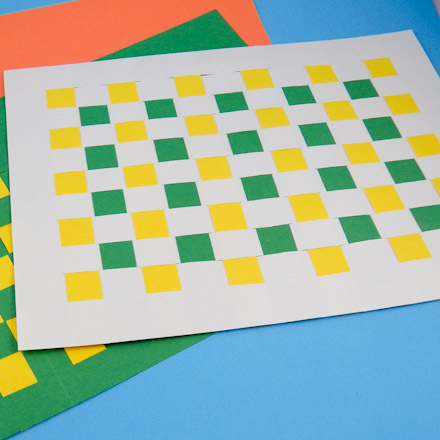 Turn a sheet of construction paper into a placemat with paper weaving. These simple to make colorful placemats will brighten your table. Turn any meal into a special occasion, whether it's a family dinner, a birthday or a party, by weaving up a set of placemats. Figure out the number of placemats you want to make and a color theme. Now it's time to get weaving! This project uses basic materials and is great for family, classroom or group craft time. This is an especially fun and fast craft for kids and parents to do together! Related crafts: For weaving with yarn, see the Weave a Pincushion and Handwoven Bookmarks craft projects. 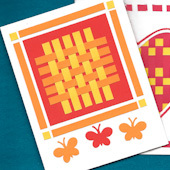 To make a greeting card with a woven design, see the Paper Weaving Cards and Woven Heart Valentines craft projects. Read through the project, then gather the materials needed for making the placemat. 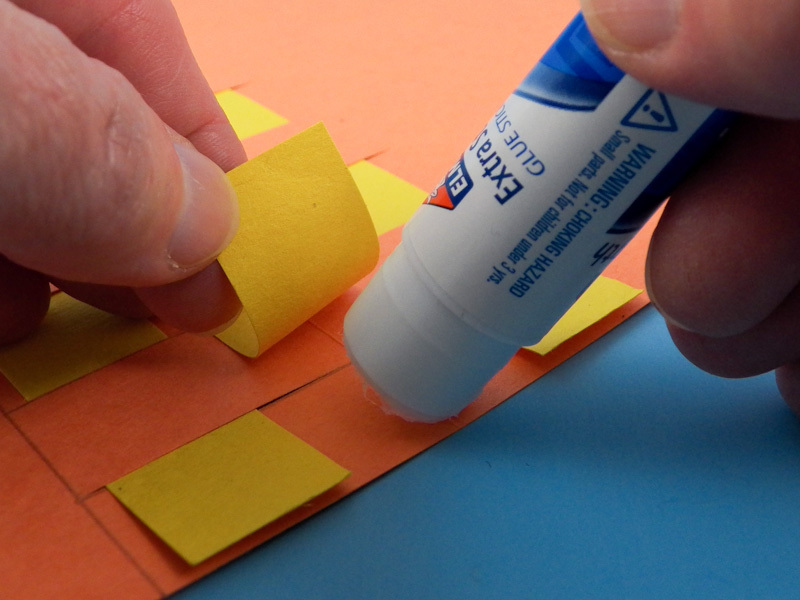 To make the craft go faster, pre-cut the paper strips. Select two colors of construction paper that go well together and contrast with each other. One color of construction paper is for the mat and the other for the weaving strips. Cut three 9" by ¾" strips from the weaving strip construction paper. Tip: White and just about any color with work, as do complementary colors like blue and orange, red and green, or yellow and violet. Analogous color combinations are also very effective. Complementary colors are opposite each other on the color wheel. They are naturally in high contrast with each other and exude high energy. Slits for weaving in paper strips need to be cut in the placemat construction paper. Fold: Score a fold line 2½" from one of the short ends of the construction paper. Use the tip of your scissors to score the line or an empty ball point pen. Fold the paper on the score line. Mark lines: On the paper that is folded over, mark a line 1" from the the paper's long edge. Next, mark a series of lines that are ¾" apart that go from the fold to the marked line. Mark the first line 1" from the bottom. There will be 10 lines total. Cut: Cut on the marked lines from the fold to the vertical line. Unfold the paper and smooth the fold. Weave the paper strips into the slits cut in the placemat. Starting from the back, bring the first strip up through the first slit and down through the second slit. Continue weaving the strips up and down through the slits. At the end, adjust the strip so it is even with the placemat edges at the top and bottom, and pushed to the left side of the slits. Do the same for the second strip but start from the back at the second slit and finish with the ninth slit. Weave the third strip like the first one. Tip: It is much easier to weave the third strip if the first two strips are pushed to the left in the slits. Arrange the strips so they are evenly spaced in the slits. Center the middle strip in the fold. Be sure the strips do not extend beyond the edges of the placemat. Turn the placemat over and glue the ends of the strips, top and bottom, to the placemat. Trim strips, if needed. That's it! Your placemat is ready for the table! 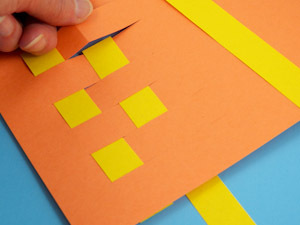 Related craft: Weave paper strips together to decorate a greeting card. 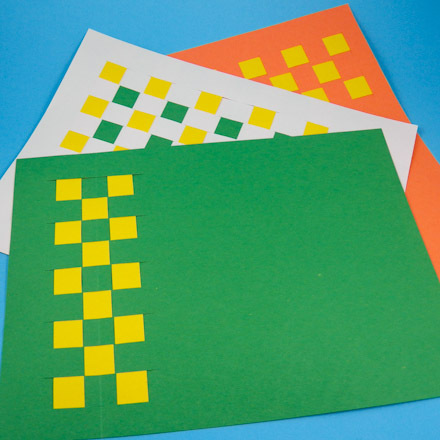 See how in the Paper Weaving Cards tutorial. Tip: Make a placemat with strips woven across the full width. 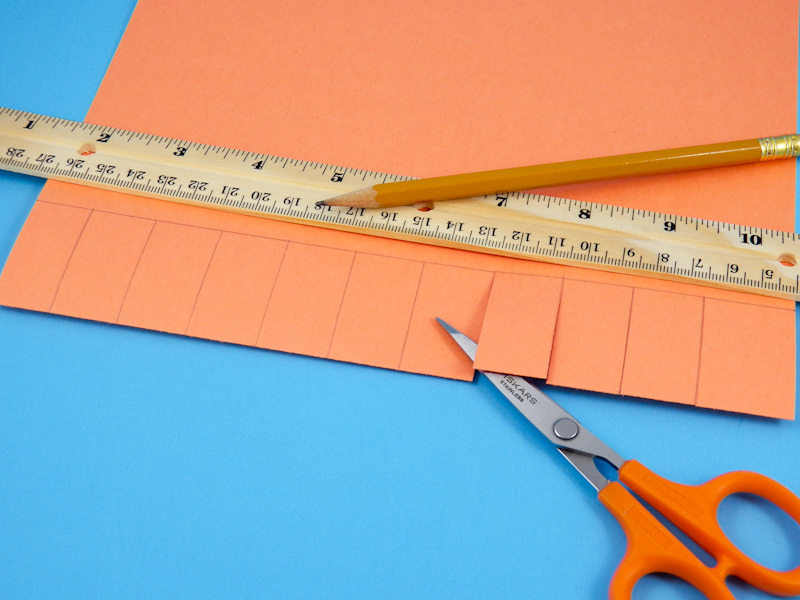 When marking the cut lines, fold the paper in half instead of at 2½". Mark the same number of cut lines, just make then longer. Cut eleven ¾" weaving strips from one color of construction paper or cut strips from two colors, 5 from one color and 6 from the other.